A Musical Experience In India, By Karen Strauss. 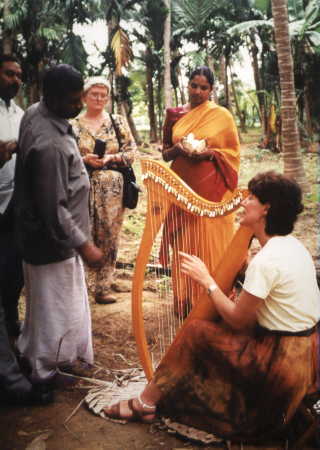 In spite of having traveled extensively both as a professional harpist and with my family for pleasure, nothing prepared me for the royal reception I received in Tamil Nadu, India, this past January. But, what brought a musician from Roslyn, Long Island, to the shores of the Bay of Bengal? 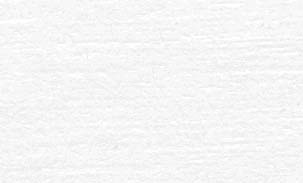 The adventure began in August, 1996, with a small notice in "The Roslyn News." The Rotary Foundation International was looking for four people, actively involved in their careers for a minimum of two years, who would like to meet their counterparts in India for a free, five-week, visit in January, 1997. The trip would involve acting as a good-will ambassador, traveling throughout Tamil Nadu, southeastern India. This circle on the map of an approximate 300 mile diameter encompassed the towns of Madurai, Trichy, Kattur, Pudukotai, Dalmiapurama, Karur and Kodaikanal. At each stop, visits would be paid to the local Rotary chapter where the Group Study Exchange members would talk about their lives and work experiences in the US. Our team was led by a Rotarian, a retired banker from Garden City, NY, father of five and grandfather of seven, which probably helped him in the patience department in dealing with four female GSE members. In addition to the musician, the team consisted of a crime victims advocate from the Nassau DA's office, an owner of an architectural and engineering firm, and an artist. Our ages ranged from 33 to 53 years, our religions included Jewish, Protestant and Catholic; our roots stretched to Africa, Poland, Italy, Russia and England; we were single married and divorced --- In short, a good sampling of "typical" Long Islanders. Because of my work as a concert harpist I was encouraged to bring a harp with me and perform whenever the occasion arose. Past musical exploits brought me to Hungaraton Studios in Budapest, Hungry, to record a CD with The New York Harp Ensemble, on board the cruise ship QEII to perform during trans-Atlantic crossings, and concert series in many 18th century churches of Southern Italy. Never before India had I set my harp down on a bed of palm leaves to play in the center of towering coconut palm trees and bushy banana plants with cows sashaying by to the accompaniment of Bach, Mozart, and O'Carolan. The best surprise and biggest personal thrill of performing on the subcontinent was the harp being an entirely virgin concept to the Indians. 99% had never before seen or even heard of this instrument. Their faces registered amazement and delight as I played for them in groups as small as a dozen to a sea of brightly sari-clad women at Covery College, Trichy, which gave me the impression of performing before a collection of hundreds of beautiful jewel-toned butterflies. I always gave a brief history of the harp's evolution as one of the oldest string instruments, demonstrated it's various sound capabilities (plucking the strings, using fingernails for a twangy effect, and drumming on the soundboard) and then launched into my performance. This was accomplished on an instrument of Irish Origin, built in Paris, France, shipped to New York, taken on four separate airplanes to arrive in Tamil Nadu, India, and produce English, American, French, Irish, Israeli, and Italian melodies! After living with several different families and meeting a variety of Indian musicians -- (mostly veena players; the veena is a five-foot long wooden, six-string instrument played from a crossed-leg, seated on the floor position, as with all Indian instruments) -- I was also able to include a Tamil song "Raravenugo-pala," a Hindu tune, and the Indian national anthem to my repertoire. These pieces naturally got the biggest raves -- people universally seem to strongly connect to what's familiar. Making music was a delight with nearby mist-covered mountains and endless plains of emerald-green rice paddies; the small towns were bursting with life and activity. Cows, three wheeled taxis, chickens, pigs, scooters, trucks, ox carts and buses all shared the two-lane roadways; lively folk music was always blaring out of a centrally-located loudspeaker. The locals walked barefoot yet contented,, sometimes dancing in rhythm to the loud strains filling the air. I know I will never forget my greeting before one performance where two rows of Indians lined up on either side of me creating parallel lines, 50 feet long, and threw flower pedals at my feet as I made my way to the stage. It was an absolute joy for me to live with and share the lives and culture of such music-loving people from Tamil Nadu, and hopefully leave them with a lasting impression of one harp's music from far away.